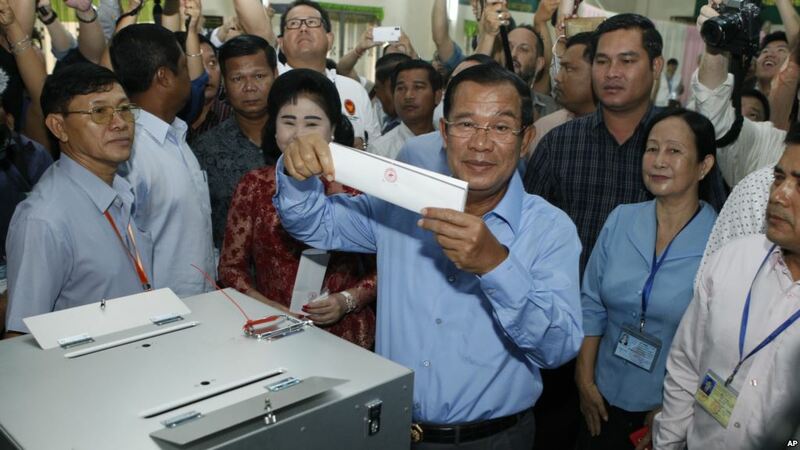 In this Sunday, July 29, 2018, file photo, Cambodian Prime Minister Hun Sen, center, of the Cambodian People's Party (CPP), holds a ballot before voting at a polling station in Takhmua in Kandal province, southeast of Phnom Penh, Cambodia. Washington, DC – The Cambodian People’s Party won an overwhelming victory at the general election on Sunday, picking up all 125 seats in parliament in the absence of an established opposition party. 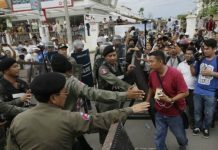 The National Election Committee (NEC) reported high voter turnout, despite calls for a boycott led by the banned Cambodia National Rescue Party and amid a campaign of intimidation.